Washington, D.C. (June 12, 2014) – As the Highway Trust Fund nears collapse, a new national random-sample survey released today shows that a majority of Americans are worried about unsafe conditions on roads and highways. Nearly three in ten say poor road conditions have contributed to an accident and two-thirds say road conditions are wearing down their vehicles. The poll was commissioned to Hart Research Associates by the Laborers’ International Union of North America. Interviews were conducted May 29 – June 1. 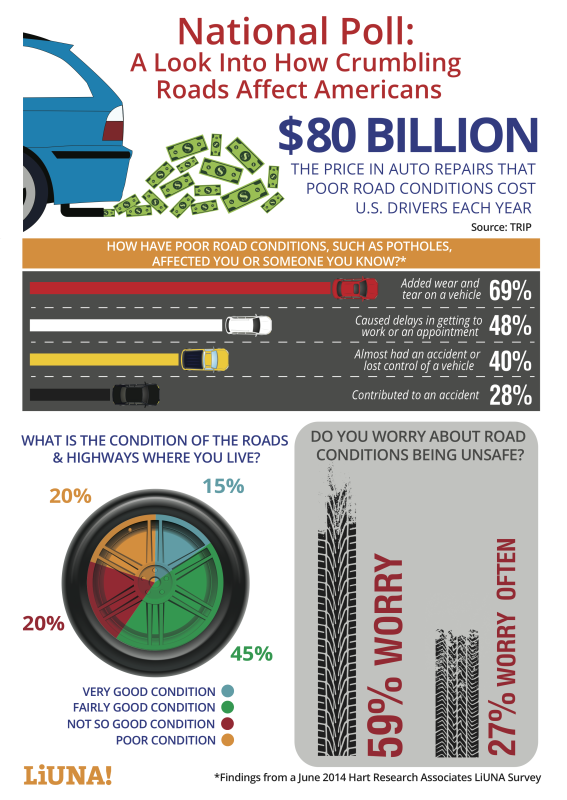 59% of Americans worry about unsafe road conditions due to poor road surfaces – and 27% worry often. Worries are highest in the Northeast (69%) and Midwest (67%) and in urban areas (70%). 28% say road conditions have contributed to an accident involving themselves or someone they know. 40% say they or someone they know has almost had an accident or lost control of their car due to poor road surfaces. 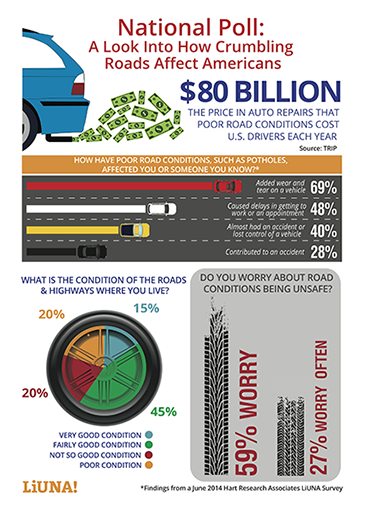 69% say poor road conditions contribute to wear and tear on their car. Poor road conditions affect people across all segments of society and across all political persuasions. Democrats and Republicans are both likely to say they have been affected. In fact, according to the transportation research group, TRIP, poor road conditions such as potholes contribute to a third of all traffic fatalities – about 10,000 lost lives a year. There are multiple proposals before Congress to fix the Highway Trust Fund and ensure a long-term reliable source of investment for roads and bridges in states across the country. Details on survey results can be found at www.liuna.org/poll. As part of its effort to advocate for transportation investment, LIUNA has launched radio ads, billboards and online action, which can be previewed at www.RepairOurRoads.org. In addition, LIUNA will kick off the “Getting Schooled in Infrastructure” school bus tour Monday in Wilmington, Delaware, where the heavily trafficked I-495 Bridge over the Christina River has been closed due to safety concerns. The tour includes a crushed school bus which will travel other parts of the country to highlight the need for a full-investment, long-term Highway Bill.